I usually make a point of starting the walking day as early as possible – to walk when I am the freshest and most alert and if the weather seems fine, then to use it while it stays good (Tasmania is known for its four seasons in one day). 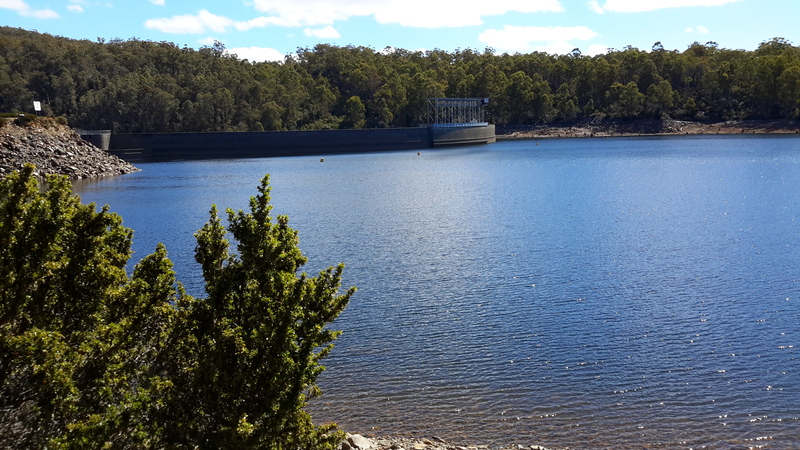 However on the day when I started walking along Lake King William, because I was constrained by other life commitments I did not leave Hobart until 1.30 pm. My driver Emma took me west along the Lyell Highway until a short distance before Tarraleah when we turned left and deviated onto a 16 km gravel road towards Clark Dam at Butlers Gorge. We dodged a few speeding cars as we travelled the narrow road, when everyone screeched and slewed in the slippery gravel on crests and unknowable corners. But I refused to worry. The sky was golden blue, the bush looked clean, the temperature was perfect for walking, and my excitement grew. My driver dropped me near Clark Dam and I started walking at 4 pm. Thankfully at this time of year the sun sets around 9pm and I knew the light of day would continue longer. I thought a three hour walk would be sufficient to isolate me and remove me from the chances of odd bods being in the locality. Not knowing what to expect, I planned for two nights out camping before reaching the town ship of Derwent Bridge. Near my starting point, fishermen and families were pulling boats from Lake King William behind the arc of Clark Dam. The water was glossy blue. The late afternoon was stunningly beautiful. I felt apprehensive but invigorated and ready to discover the Lake one step at a time. 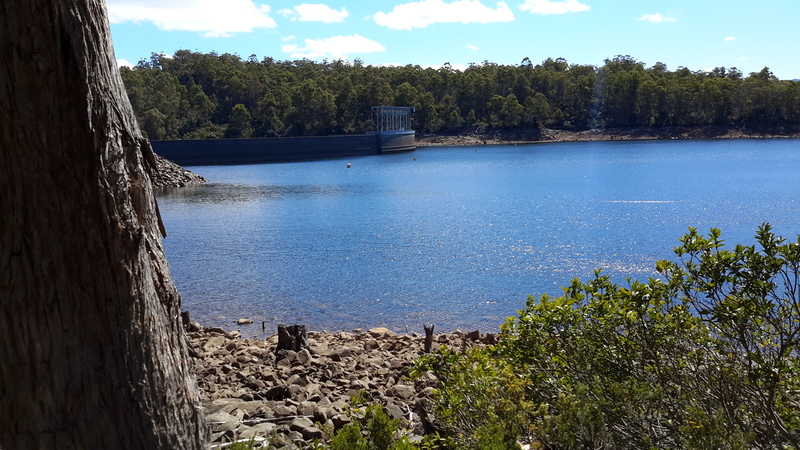 This entry was posted in Derwent River, Tasmania, Walking and tagged Butlers Gorge, Clark Dam, Derwent Bridge, Derwent River, Hobart, Lake King William, Tarraleah, Tasmania on January 12, 2016 by Tasmanian traveller. I enjoy late afternoon walks. The colours are often different to earlier. Yes that’s true. The quality of light is different. I was surprised how much I liked that part of the day.